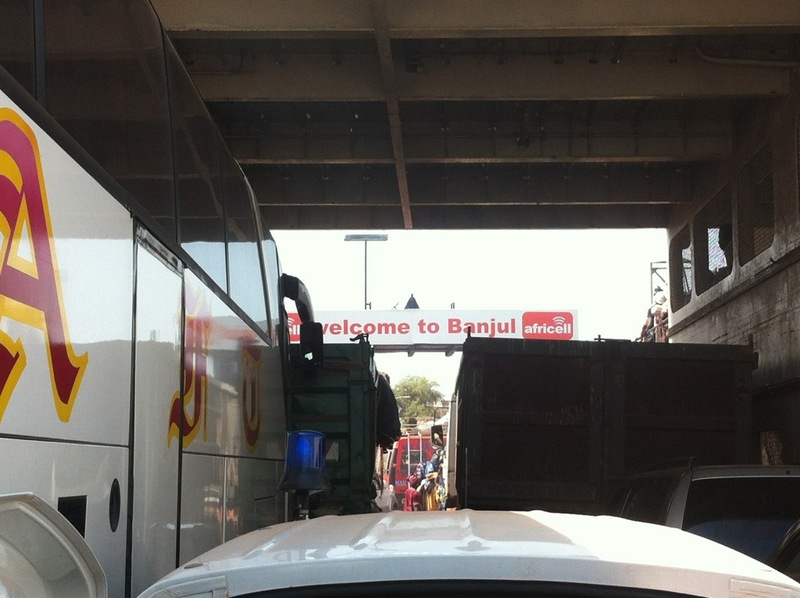 Welcome to Banjul! What a great sign to see after a very sweaty ride into The Gambia. We have done it. 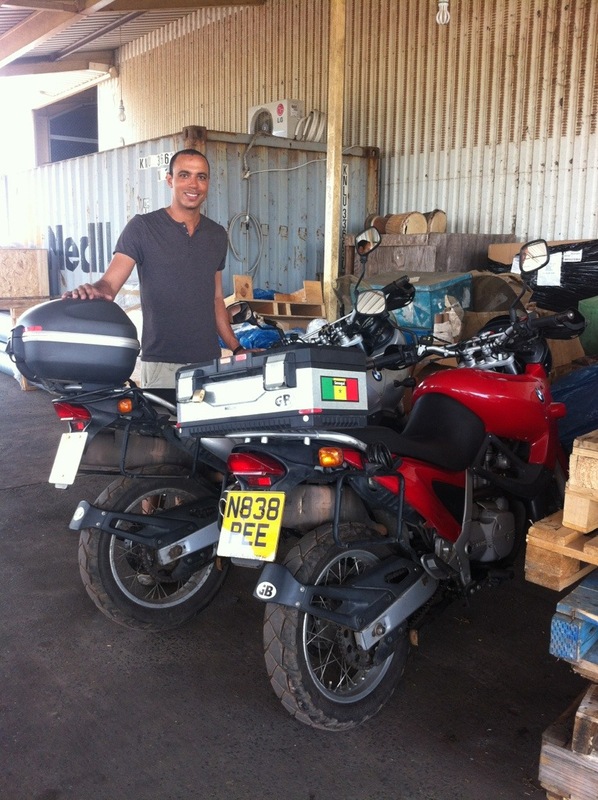 We’ve ridden 7,000km from London, through the desert and around West Africa. It’s is such an amazing feeling but now we’re sad to say goodbye to the bikes as we relax until we fly home on Thursday. The last few days updates will be posted soon! Little did we know when we ate it but breakfast at Keur Thierry was our last bread and jam breakfast. Something we had moaned and joked about the whole way from Morocco. I never thought I’d miss it! 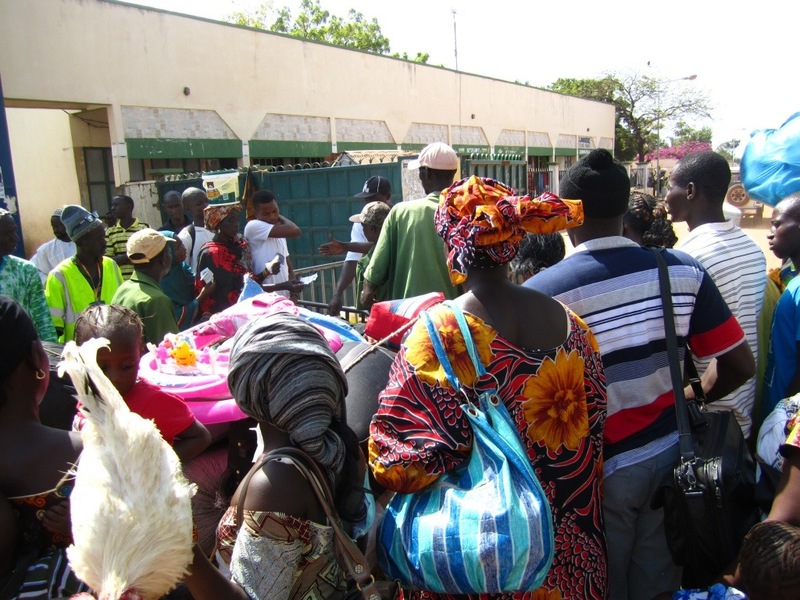 It only took us about 30minutes to ride to Karang, the border town between Senegal and The Gambia but the second we arrived we were pounced on by a group of Gambian women. They were keen to show us where to go so that they could persuade us to change money with them. When surrounded by a group of basically rude people, the last thing we wanted to do was use their services and we hadn’t worked out before hand what a good rate was anyway. We’d been warned that pick pocketing was high on this particular border (not sure why this should be worse than others?) so David went off with the paper work to sort out official number 1 while I waited with the bikes. I was now surrounded by a group of dirty kids wanting money, of course. They were actually quite entertaining playing and teasing each other which I was amused at watching. The funny thing about the border crossings that we had encountered was that it was never obvious where you had to go, for what paper work and once again, relied on others in the queue to point us in the right direction. The next official guy we needed to see was customs. There seemed to be a few different customs guys who needed to see our bike papers but each time our papers were in order and they were happy. We sat down in a smartish looking office but before we’d hardly spoken, a guy wearing an ‘official tour guide’ shirt stormed in with papers and a disagreement broke out. It was hard to know what was happening but clearly manners didn’t come into it! Once he had left and our papers were being looked at a man outside passed a cup of tea through the window to the official guy which Louise made sounds of wanting. It was handed straight to Louise and she sat enjoying a cup of freshly brewed African tea. Everything was hand written in a book titled ‘arrivals reg’ written in blue biro. I’d love to know how often their official registers are looked at! The guy’s first question to us was to find out if it was our first time in The Gambia and when we said it was he replied ‘You’re very welcome’. The official guys were incredibly proud to be Gambian and were pleased we had chosen to visit their country. All of this, of course happened in English which was music to Louise’s ears! Next came customs who we were expecting would want to check our bags, double check them and possibly search through the contents once more. We experienced the opposite. The guy was friendly, asked what we had and was happy to accept the answer, then gave us the signed forms and asked for 300Dalasis for each bike. Thinking about it now, I’m pretty sure that wasn’t an official cost. He had a very relaxed friendly manner and handing money over seemed normal. We never received a receipt and wish we’d questioned it! He told us the next guy would need 100D per bike…we weren’t asked for money by anyone else…just as we were finishing with customs, an unobviously uniformed man appeared asking to see our yellow fever vaccination card. It’s a requirement to have the vaccination if you’ve travelled from a country where you could have picked the disease up. We showed our certificates and went on to the last guy for our final passport stamp. As we rode into the border area; it really is just a large area with a kind of official border but nothing like what we are used to when crossing from England to France for example, there was a sign that said ‘Welcome to The Gambia’ which Louise was determined to have a photo next to before we crossed through. Officials are funny about photos at border crossings so Louise suggested she’d ride near the sign, then once in position, David would follow, Louise would quickly take the photo and we’d be on our way. The second Louise rode back towards the sign, a number of policemen and people near by ran after her beckoning her in the right direction!! We never did get a photo with the sign. Into The Gambia we rode and it looked surprisingly like Senegal. The road was tarmac with sand and dust surrounding the edges, the trees were lush, baobabs could be seen along the way and women walked along with bundles of produce on their heads. We came across the first Gambian police check of the day. The first guy came over and said ‘BMW, be my wife’ which at this point we hadn’t heard before. Louise laughed, then he said, ‘maybe you should leave it behind for me’.. Hahaha, while this was happening the lady police women told David she liked his Mercedes Benz high vis vest and said she needed one like it. We gave the policemen one of our badges as a gift on the condition Louise could take a photo of him! 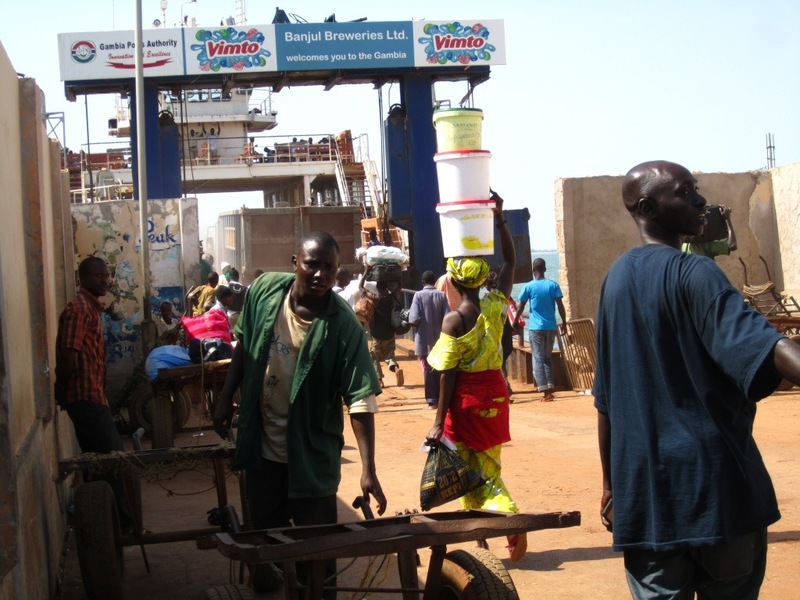 We needed to buy our tickets for the ferry to Banjul but the ticket office had a computer failure which meant picking them at the ferry terminal instead. As we approached the craziness of Barra, we headed over to the ferry and Louise went off to buy the tickets. People pushed and shoved to get to the hole in the wall where the tickets were bought. With 10D notes in their hands, it was a case of push your arm through the gap and the women behind would swap the money for a ferry ticket. Great, try fighting this mob with heavy motorbike kit on and with no idea how much our tickets would cost. Used to this type of fight while trying to get on a 343 bus at Elephant and Castle back home, Louise sharpened her elbows and gave as good as she got. Manners went out the window and after managing to actually get to the window she came away with two passenger tickets and a ticket for each bike. David in the mean time was busy with locals asking about the bikes, trying to sell him things and kids trying to sell their tour guide expertise. We didn’t have to wait long for the ferry but of course it took a while to load up. We had to wait with the carts along the side while cars and trucks rode on. When we finally boarded, our bikes were wedged into a gap amongst the other vehicles. This was pretty helpful considering there was no means of strapping the bikes down! We walked up to the deck to find some shade and revealed our sweat soaked tshirts from under our jackets. We were the only white faces around but no one seemed remotely bothered by us. Over the next hour we watched women walk through the crowds selling peanuts, bags of ice drinks and cakes, women breast feeding, guys sleeping on gravel on top of trucks and women trying to create shade by tying their shawls to the broken wire gratings. The car in front of our bikes was full of policemen who were fascinated by the bikes. Of course they asked for the bikes. We had two bikes, therefore we could leave one behind, right? This was becoming tiring and we’d been here less than one day! 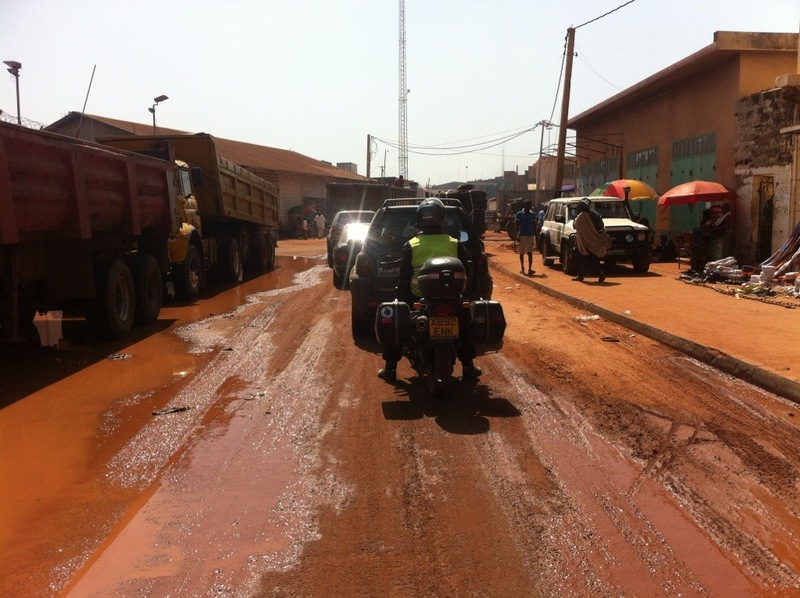 We left the ferry to a large ‘Welcome to Banjul’ sign and entered Banjul through muddy dirt roads and then a piste until we joined the main road to Bakau. We were at our final destination, Banjul, The Gambia. After a deserved lie-in and wholesome porridge breakfast with Caroline and family, we set off for The Gambia around mid-day. Not surprisingly though, one of the bikes wouldn’t start. 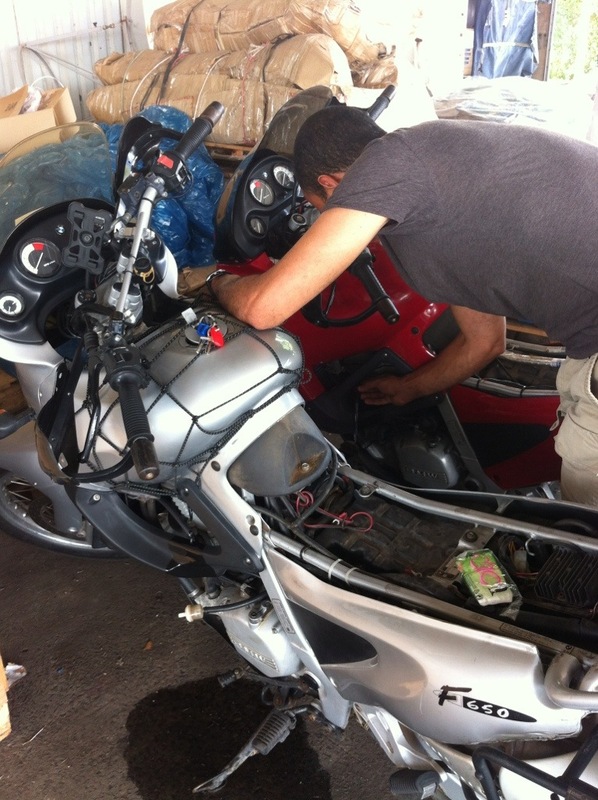 This time it was David’s bike with the same sounding problem that Louise had had in Nouakchott; the starter would run without starting the engine followed by a very loud backfire! 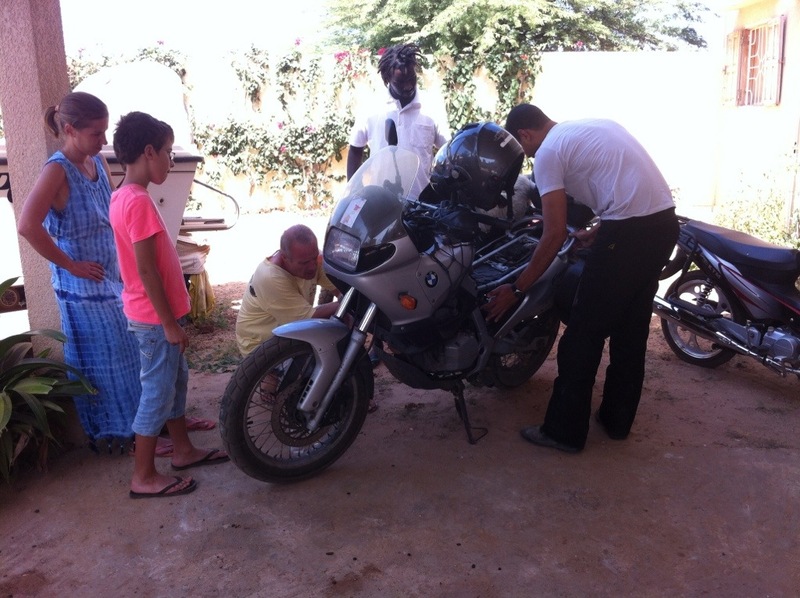 Caroline has a French neighbour who it turns out is a keen biker and he soon came to the rescue. He appeared with alcohol to clean the spark plugs and a helpful, problem solving attitude. There must have been an airlock and after some poking around and moving of pipes, we were on our way. Caroline and co in the mean time had a chance to experience what our last month had consisted of! Even the local sheep came over for a nosey. We rode fast, passing through small villages and past huge baobab ‘upside down’ trees, to Kaolack, a junction town for people travelling north/south and east/west through Senegal. It’s a classic busy, bustling, dirty town where food is traded, trucks refuel and horns are honked. We rode through quickly hoping to find some snacks on the other side of town to pick up for our lunch. Instead before we knew it the shops were well gone, we were the only ones on the road and our right turn south west towards The Gambia left us feeling like we were in the middle of no where. 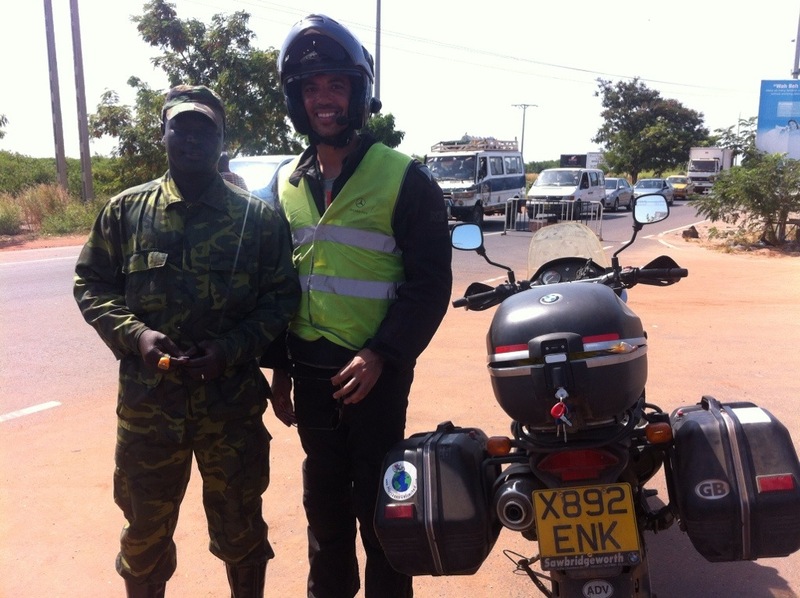 We had wanted to take the TransGambia Highway to a town called Farafenni in The Gambia so that we could then ride along the river Gambia and experience some of The Gambia before reaching Banjul. After some google searching it turned out that the ‘TransGambia’ highway which looks like a major road on the map is an awful dirt track and would take us hours on motorbikes. There was no talk of the road (N2) to Karang, the border town nearest Banjul being bad so we felt confident we could complete the 60km before sunset. That was until the tarmac ran out… First of all we experienced a few miles of tarmac with HUGE pot holes which made the traffic (including large trucks) weave all over the road, then the road became a few miles of bad, wash board piste, then in the distance tarmac would appear again. It was hot, we were sweating a large amount and it was hard to know a) how long we would have to tackle this type of road surface and b) whether each piece of tarmac in the distance was real or a mirage. We hadn’t managed to have any lunch and it was becoming more and more obvious that we wouldn’t make the border before sunset. Neither bike had a break light working (the vibrations from previous washboard riding had jiggled the connections on both bikes! 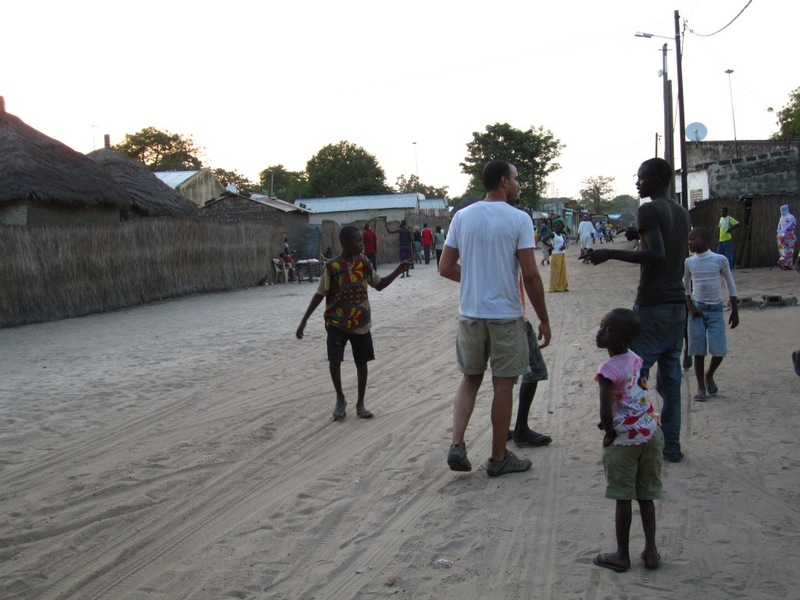 ), we were hungry, feeling dehydrated and frustrated we wouldn’t be in The Gambia that evening. Washboard is tiring to ride on. Not only do your bones and teeth rattle like crazy but the poor bike is put through hell. We stopped at the first petrol station we came to in a small town and decided to use the last of our CFA to fill up and buy a large bottle of Sprite. We found some shade from a local bus and sat down to regain our strength. Lunch was half a bottle of Sprite each and some cashews we’d bought at the start of the day. The sugar/energy was exactly what we needed! While sitting in the shade we could hear some amazing drumming and singing coming from the building opposite and a guy sitting with the bus said it was because of a baby. We assumed this meant it was a christening and enjoyed the sense of community celebration. I wish we had gone over and had a better look but all I could do was muster the energy to drink and eat. 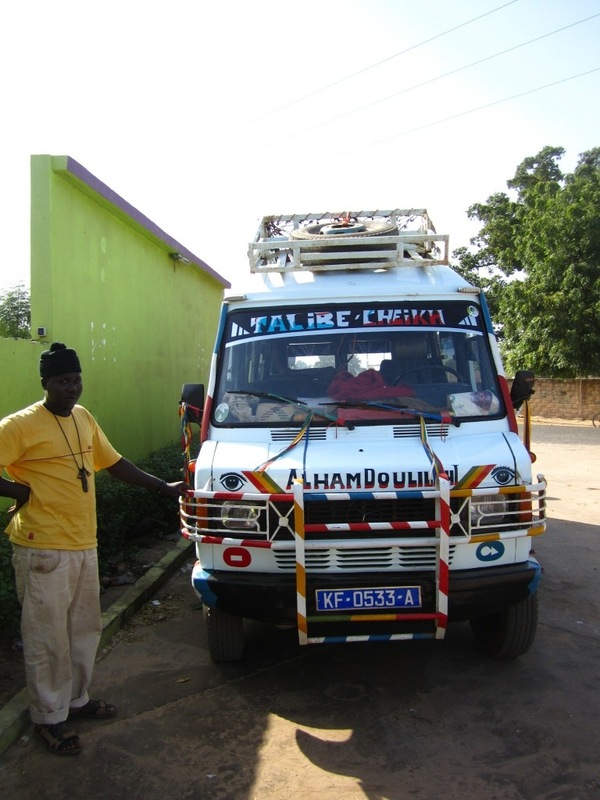 The guy greeted us as ‘toubab’ which means ‘white people’, then in basic English asked us about our bikes and where we had come from and then proudly had his photo taken in front of his bus. Where we were felt very remote but after reading in the guide book it turned out there were a couple of villages approaching before the border where we could find somewhere to stay. As we rode a little further we saw a pig crossing the road. This felt like seeing a lion cross the street in London. We’d been in Muslim countries for a month and forgot that pigs existed. This clearly meant the cultures and religions must be changing. As we approached Toubacouta a couple of local guys asked us what we were looking for. We were very dubious of anyone asking us questions because sadly, up to now, it always led to wanting some kind of money. There appeared to be a different feeling about this place though and people were genuinely being helpful. A guy on a scooter led us down a dirt track to a guest house to stay in, dropped our kit then walked into the village to buy water and change some money. We hadn’t planned to still be in Senegal and therefore had used up all our local currency. 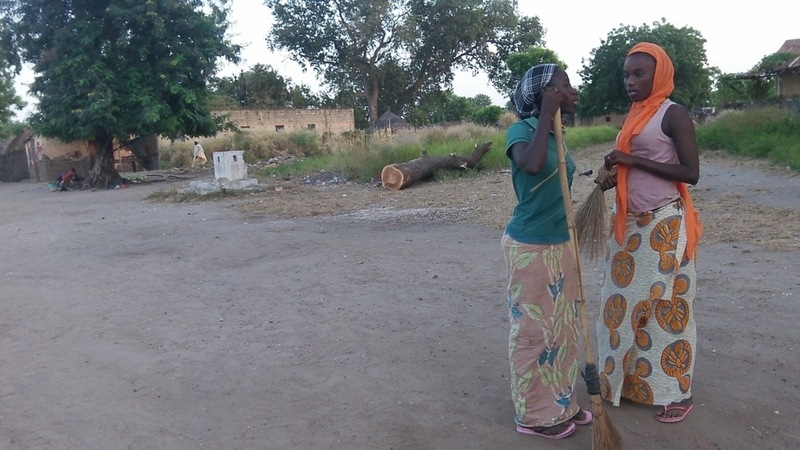 As soon as we entered the village we were pounced upon by a group of giggling girls carrying broomsticks, asking for money to help for the village youth association. We asked them if there was somewhere we could change money and within seconds they had led us to the ‘Mauritanian guys’ where CFA could be bought! We gave the girls some money and off they went to do some more fund raising. Round the corner we could see groups of men raking the sand to collect twigs and scattered branches, girls using home made stick brushes to sweep up the streets and people walking along picking up rubbish. 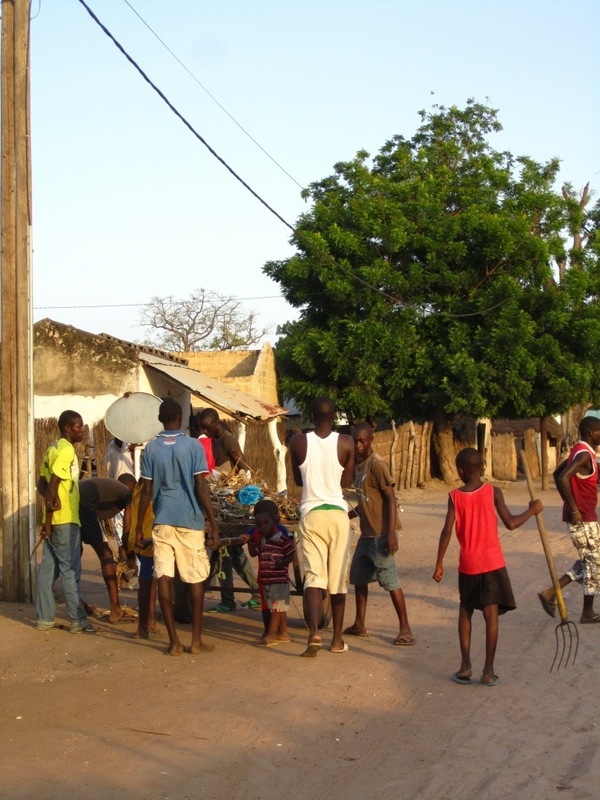 We stopped and watched for a moment until a guy came up and explained that every Sunday the village’s Community Association, made up of the local children and teenagers come together to clean the village. Once the chosen areas were cleaned, everyone would come together to pray then discuss which area they would clean the next Sunday, after which those that had done the cleaning were handed sweets as a thank you. This happened on a Sunday because the children go to school Monday to Saturday. The guy explaining all this to David (in French) introduced us to the President of the Association who spoke surprisingly good English. 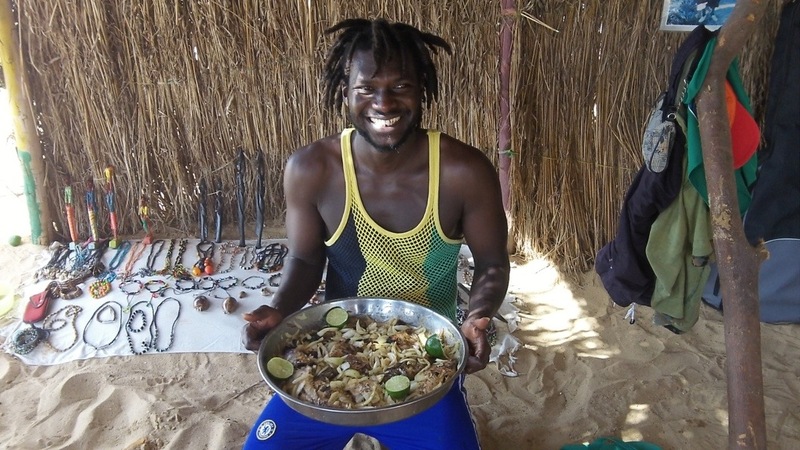 We hadn’t come across many people on Senegal who spoke English but he explained he was studying at Dakar University and learnt his English there. Villagers would give the youth money for cleaning and this money would go towards activities organise by the Association. It was such a fantastic sight to see everyone busy cleaning, the little ones helping push the carts and the older kids taking responsibility for the tasks. 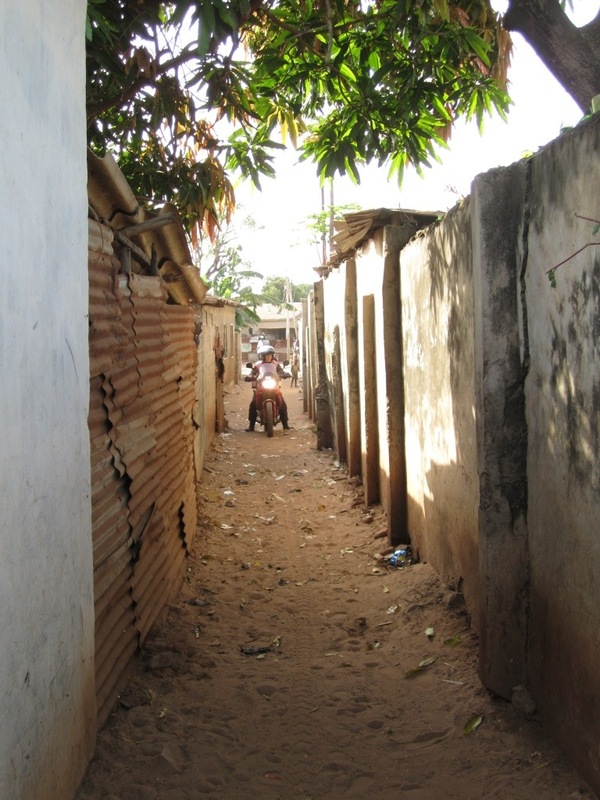 For most of our time in Senegal we’d only seen dirty streets, been pestered by people and hadn’t felt the same sense of community and pride that we’d seen in Toubacouta. The president explained how their village was made up of a mix of Christians and Muslims and both lived very happily together. Each religion would include the other in their festivities and Christmas played a bit part in the village. He also explained that the village was very poor and any advice for how they could improve and develop their Association would be appreciated. We swapped contacts, gave them our ‘two wheel exploring’ badges and we went back to our guest house feeling very privileged to have met this group of people and experience their Sunday clean up. This was exactly the type of experience I’d been hoping for on our adventure! 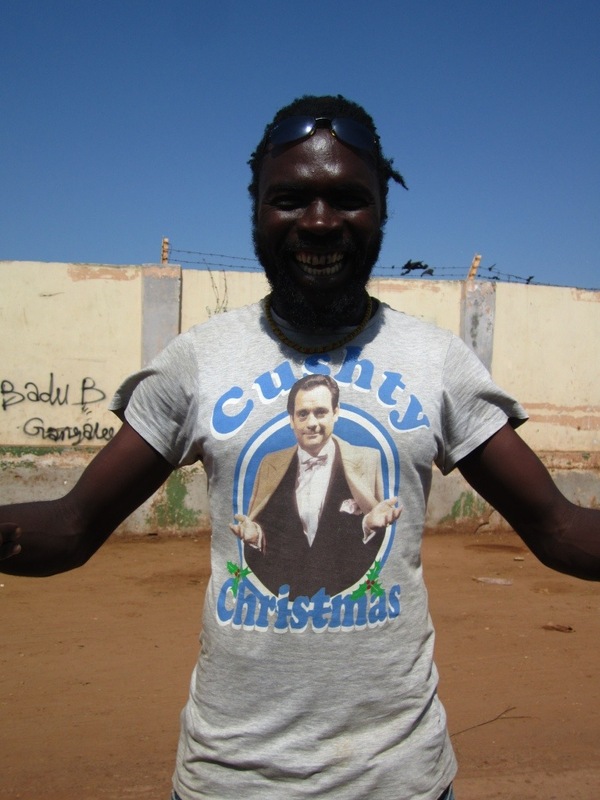 Our faith in Senegal had once again been restored! We arrived in La Somone and instantly felt like we were in a completely different part of Senegal. It was much more relaxed than Dakar, had more of a beach holiday vibe about it and we were greeted by Caroline, a Brussels school friend of David’s. 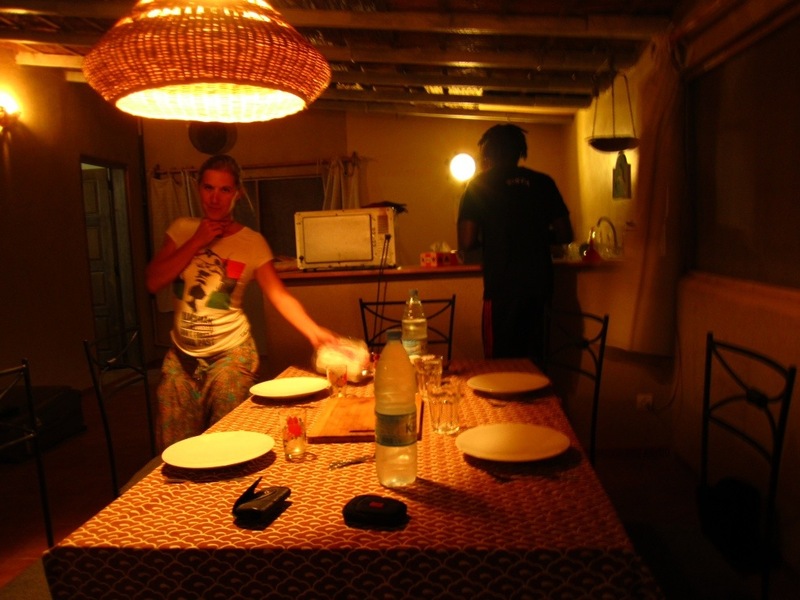 Caroline has settled in La Somone and was wonderful at giving us an insight into local life. Her husband is a reggae artist and knew exactly where to go that evening to listen to some live music. We went to a restaurant/bar to hear a Senegalese band and were entertained by the traditional dancers performing alongside. One of the best features of the night though was watching the local kids loving the band and creeping closer and closer to get a good view. Their excitement was infectious and rhythm perfect. The next day we headed to the beach armed with sun lotion, water and a guitar. 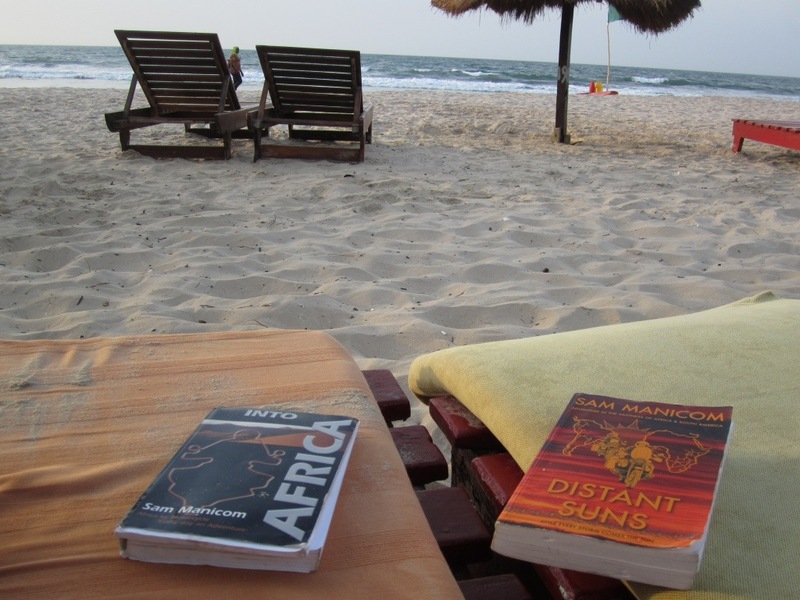 It was the first time we had been to an actual Senegalese beach south of Saint Louis. We walked along the sandy beach and soon came across a group of fishermen who were struggling to bring their boat away from the water. 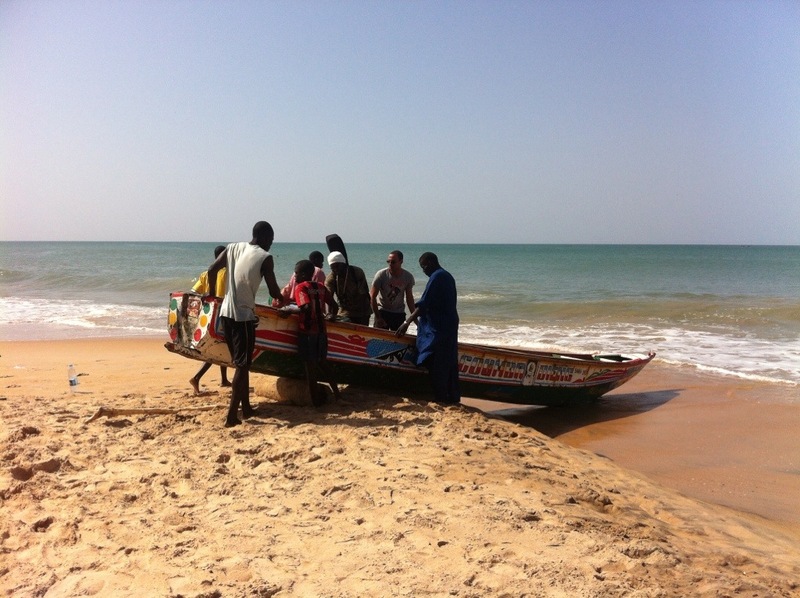 The fishing boats in Senegal are long wooden boats decorated with wonderful bright colours. It’s a fantastic sight seeing them all lined up at the start or end of a day. The boat was clearly heavier than it looked and Moussa and David went over to help them drag the boat up onto the beach using a round piece of wood to act as a wheel to maneuver it. 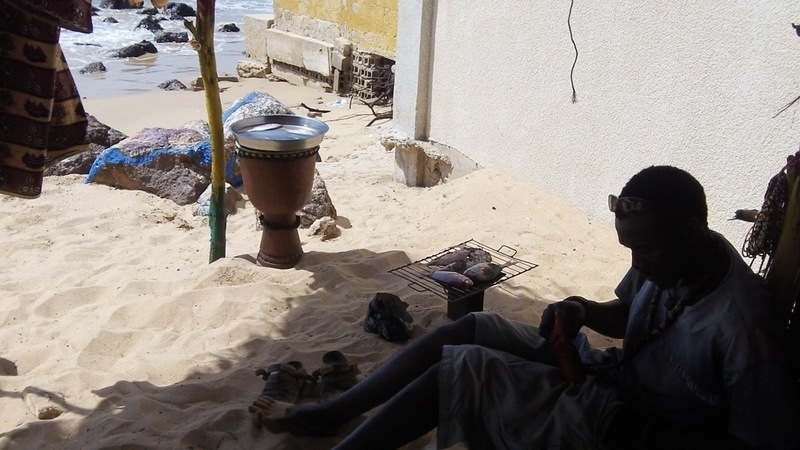 We carried on walking to a beach hut where a friend of Moussa’s sells jewelry and instruments to passers by. The hut was a wood and reed construction with an idyllic view of the ocean creating perfect shade for an afternoon of hanging out on the beach. After a number of cups of Senegalese tea (a delicious mix of green tea and mint which is oured back and forth between cups until a thick foam is created) which was being made over a charcoal fire in the sand, we rushed straight off into the sea and cooled off from the mid day sun by jumping the waves as they came in. 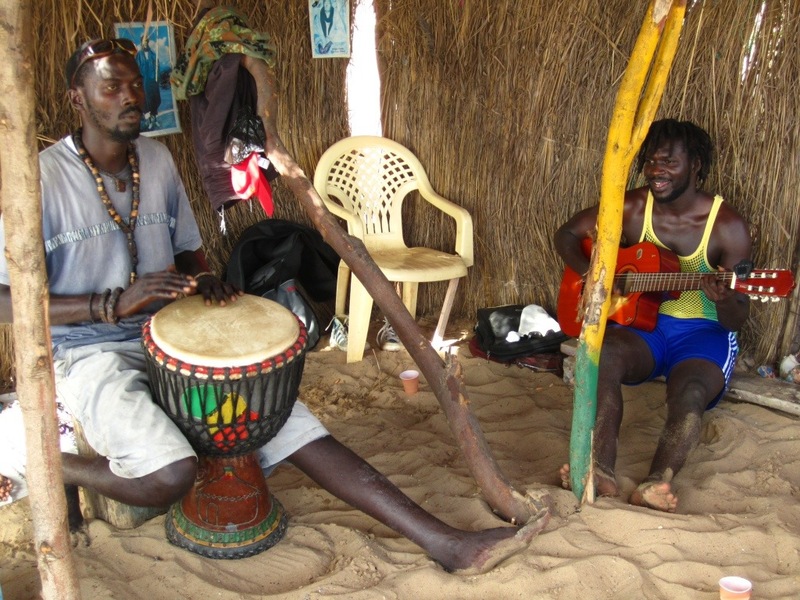 Under the hut, Moussa started to play the guitar and had us all singing and tapping to the reggae beats he was playing. Trust me, the rhythm and melodies of ‘I’m Mr Lion Man’ and ‘Salam Alaikum’ are contagious…! Caroline and Moussa (known as Lion Man) perform together and this was a great insight and private show of their work. 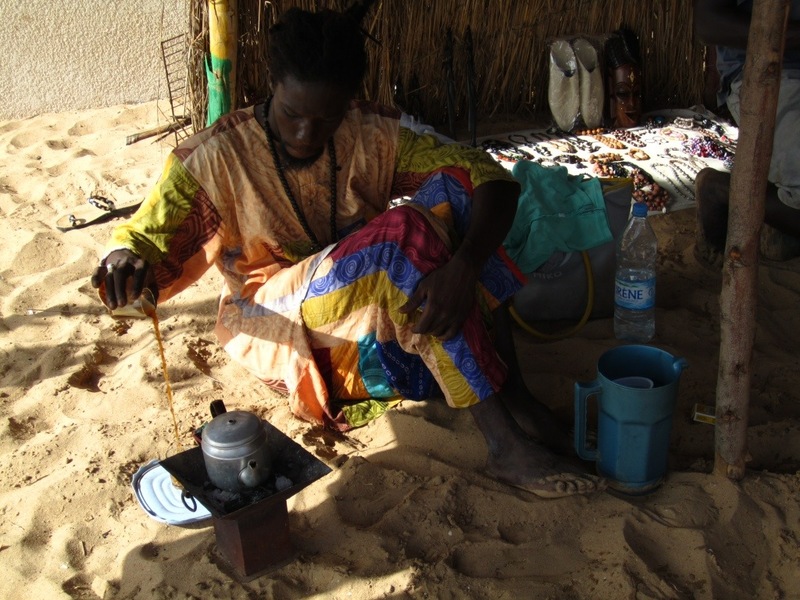 While this was going on, Moussa’s friends were busy starting a charcoal fire on their metal cooking stove. A grill was washed in the sea, fish was brought back from the market, onions were being chopped and bags of condiments were added to the mix. This all happened very seamlessly and before we knew it, a complete fish meal was put in front of us. The 7 of us sat around the dish, cross legged on the sand and eat the meal with our fingers. It was delicious! After we had eaten and all evidence of any form of meal hidden away, Moussa brought back out his guitar and this time played accompanied by a djembe (a style of African drum). We couldn’t have asked for more. This was local La Somone life surrounded by amazingly hospitable people, beautiful scenery, the sea to cool off in and all while listening to talented musicians! We left the beach hut and walked back past the fishermen to pick up food for our evening meal. We came away with 1.5kg of thiof, a common fish in the area and David cooked up a second feast for the day, this time at home with just the five of us.